Nikola Tesla was a multi-disciplinary genius. His discovery of the rotating magnetic field in 1882 led to a series of US Patents in 1888, which gave us the AC electric power system still in use today. This one achievement earned him the honor of being called “The Man Who Invented the 20th Century”. But his research went way beyond what has found its way into everyday use. He is the recognized inventor of the brushless AC induction motor, radio, remote control by radio, super-conductivity, fluorescent lighting, the bladeless turbine engine and pump, the capacitor discharge ignition system for automobile engines, the mechanical oscillator, and dozens of other inventions. But he also discovered that useful energy could be extracted from the heat of the ambient air, and that electric power in the form of Radiant Energy could be broadcast to everyone in the world through the ground. In his masterful article The Problem of Increasing Human Energy, first published in Century Illustrated Magazine in June 1900, Tesla discusses the “energy situation” like never before. After discussing every known method of gathering energy from the Natural World, Tesla departs into the unknown. His first discussion is about a machine that can gather heat from the ambient air. He calls it a “Self-acting Engine” since it could run indefinitely from the solar energy stored in the air. He called it “the ideal way of obtaining motive power”. Tesla worked for years trying to solve all of the technical issues presented by the idea. His work with liquified air, his discovery of super-conductivity at ultra-low temperatures, his bladeless turbine and mechanical oscillator were all spin-offs from his work on the ambient air engine. He was convinced the system could work and that it was absolutely the best way to harness solar energy. On a world that is warming up, tapping ambient sources of heat in the air, water and ground are the most important technologies to develop at this time. For an in-depth expose on Tesla’s amazing “Self-acting Engine”, click here. But Nikola Tesla’s most famous attempt to provide everyone in the world with free energy was his World Power System, a method of broadcasting electrical energy without wires, through the ground. 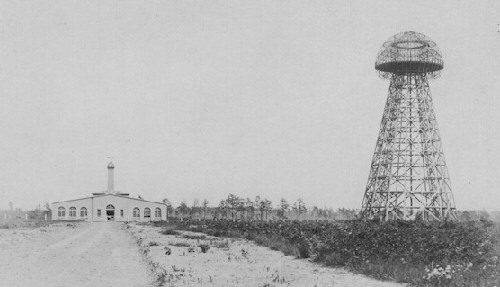 His Wardenclyffe Tower, pictured above, was never finished, but his dream of providing energy to all points on the globe is still alive today. to Magnify Power is finally explained!